This major addition to our Battleground WW2 Series covers the U.S. airborne and seaborne landings on the Cotentin Peninsular on D-Day 6 June 1946. 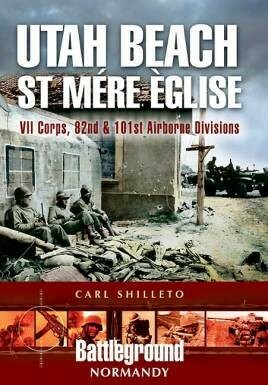 It tells a dramatic story of near disastrous drops by the U.S. 101st (The Screaming Eagles) and 82nd (The All American) Airborne Divisions and how they gallantly regrouped and gained their objectives at St. Mere Eglise and Carentan. Meanwhile the 4th U.S. Infantry Division were the first American seaborne troops to land (at Utah) followed closely by the 90th Infantry Division. This book graphically describes how these divisions eventually linked up and succeeded in cutting off the vital port of Cherbourg. The book also describes the 'big picture' leading up to D-Day and is particularly interesting in its revelations about the notorious 'Operation Tiger' when over 700 American troops died during training. Carl Shilleto is an author and historian.